Plucked and packed in a mixture of olive oil, herbs, and spices, these large pitted Kalamata olives will put the perfect finishing touch on any dish. Customers of your restaurant or cafe are sure to love their dark eggplant color and smooth, rich flavor with a hint of salt. You'll be in good supply with these generously-sized Kalamata olives, pre-pitted to save valuable prep time pitting by hand, preserved in a large 4.4 lb. container and ready to serve. Offer an impressive olive bar or extensive salad bar, or serve these olives as a savory topping to pizzas, flatbreads, subs, or pasta salads. Use these olives to create an appetizing Greek salad with cucumber, feta cheese, onion, and tomatoes. Popular to Italian or Mediterranean fare, these olives can be served alongside a variety of entrees, including tuna, pancetta, and grilled chicken. The taste of Kalamata olives is paired well with artichokes, sun-dried tomatoes, roasted red peppers, and more! Fantastic Kalamata Olives, I was making a Mediterranean salad for our restaurant and I couldn't get a small pack size from my food service provider and getting them from the grocery store was very expensive. I thought I would give these a shot and I am happy I did. The pack size is perfect the price is phenomenal and the flavor is wonderful just what a Kalamata olive should be. I PURCHASED THIS BRAND FOR THE HUMMUS AND GREEK SALADS FROM WHOLESALER THE FIRST ORDER , THEN WENT TO REORDER THE SAME PRODUCT AND THEY DID NOT CARRY THIS BRAND ANY MORE BUT THE BRAND THEY HAD WAS EXTREMELY MORE EXPENSIVE AND WHEN STARTING THIS NEW BUSINESS , WE HAD TO FIND ANOTHER SOURCE AND WE FOUND THE SAME BRAND HERE AT LESS EXPENSIVE THAN THE PRICE WE BOUGHT BEFORE ! These are really good olives, and a lot of them! The container comes with a plastic basket that keeps the olives submerged in the brine. There are a few pits, so be careful! Great tasting kalamata olives! They are jumbo olives I have found and are probably about the size of your thumb. However, I gave them 4 stars because I have found several olives with pits in them. I order a lot and Half of the olives are crushed and unservable only a few are nice and round the taste is good but definitely not presentable. We appreciate your feedback! We’re sorry these did not meet your expectations. A Customer Solutions Representative will be contacting you soon. These are great Kalamata olives. After buying these, now I always have to have a jar in my spare refrigerator. We just use them for home use, and they last long enough for just two of us. I mean they don’t go bad or anything. But this way I can always have kalamatas to put on pasta, wood fire pizza, or salads. I never wrote a review but this time I am because I bought 2 jars of this olives and it’s NOTHING like it says on the description they’re very salty waaaaay too soft and waaaay too small they feel like they were soooo old I can’t say enough how bad these olives are . I was reeeeeealy looking forward to find out they’re less than nothing I threw them away , I hope the site don’t buy these olives anymore . These olives are perfect for a tapenade, or for an appetizer platter. They are stored in a brine that keeps them good for a very long time. Absolutely excellent Kalamata Olives. These are the only brand we'll purchase, obviously authentic as they're imported straight from Greece. The 4.4lb is a great pack size, and I guarantee you won't be disappointed with the flavor. Great buy! A must for any antipasti tray or bar. These Kalamata olives are big and delicious with a great flavor. The olives are well packaged and are always fresh. These olives are excellent. We like to get the full cases so you can make sure to maximize on all the savings available to you. A top quality olive that is great for our antipasti trays and olive bar. The Kalamata olives are also perfect in our Mediterranean salad. They have a great flavor. These olives are both delicious and a great deal. We make them into tapenade, but also offer them as additions on our catering menu for customers. A nice salty olive that makes a great addition to our pasta salads. The Kalamata olives are bursting with flavorful and make a great addition to our salad bar as well. These are really nice olives. The Kalamata olives have a reddish tone to them and a bit of a sweeter taste than other olives. They are really salty but very good added on the side to dishes or salads or of course pasta and pizza. They come well preserved. A wonderful value for over four pounds of pitted Kalamata olives. The olives tastes great and are prefect in salads and on pizzas. They are a wonderful quality. Delicious, high quality imported olives. We always have these available, and even after they are opened, they last a long time. Having so many olives on hand at such a great price we use them as ingredients in all sorts of cooking from salads, to chicken to pizza...and of course on their own as a snack. Great value!! Great buy on great products we use these on flat breads and our customers love them. Super quality and the container size is perfect. Get yours today! Great olives for the money. 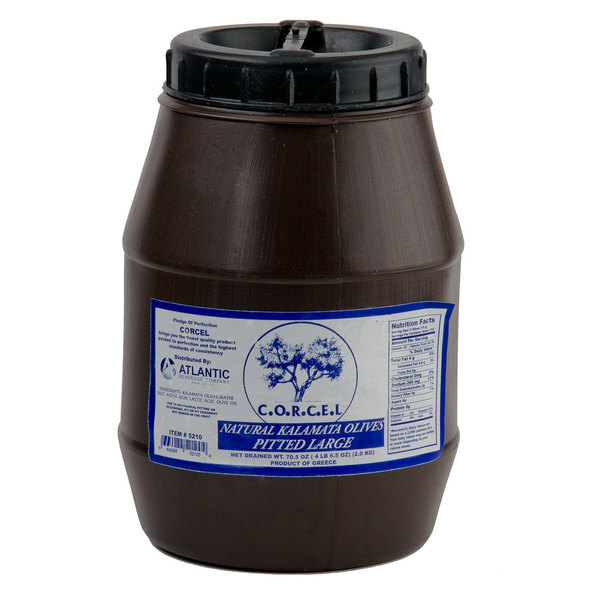 The 4.4lb jug is great, easy to access the olives while you are using them for your favorite cooking recipes. I'm not a fan of these olives. I love webstraunt store overall, but this product was not adiquit no matter what the cost of it is. We appreciate you review, Tom! If you ever need a recommendation for a different brand of olives, please contact our Customer Solutions team. Awesome buy on these pitted Kalamata Olives! Purchased from Webstaurant Store at a fraction of the cost of my national food provider. Great deals here! These are the larger size pitted olives so they look good in antipasto and on buffet spreads. They taste as black olives are expected to taste.. These are my favorite olives of all time. Great price, better flavor then any I can find locally and they last just long enough to use for a variety of dishes. Plus there is enough to just eat by themselves. Kalamata olives. Pizza, calzones, heaven. The 4.4 lb. container of Large Pitted Calamata Olives from Webstaurant store is a good deal. It should last a long time - but with the way we go through them, it won't! I ordered these olives in a bind when I was not able to receive them in time from my normal supplier. Overall good taste and value. If you like calamata olives this is a no brainer. Price is right and the container is beautiful. I really like the taste of this. I use it to cooked several dishes. One of my favorite is tilapia with calamata cooked on parchment paper with generous amount of extra virgin olive oil, pinch of cayenne and other spices in the pantry. Perfect! Excellent olives, of very high quality.Tasty tasty....these will be delicious in my olive bread. I have many uses for these olives, plus are delicious eaten alone. An absolute steal at such a low price. Quick delivery, great product. These olives are delicious! I serve them frequently with our meals - including (photo attached with review) one of my favorites: angel hair with ghee, basil, and topped with these olives. there is no such thing as a Greek salad without the pitted Calamata olive. its a great product at a fraction of the price of the other big company's. Very good tasting olives, with minimal ingredients. You get both brown and green colored in one jar. The jar is great, a very good seal for re-use. We use these for sandwiches and salads and they really add a nice salty/briny flavor. You can't beat the price either! THe local place in town charges twice as much for the same size. These kalamata olives have a great salt flavor. I love the pitted ones, they are great for snacking or topping on pizzas and italian sandwiches. Really a great deal as well, for 4.4lbs. The resealable container is great too. Wonderful calamata olives. They have a delightful rich salty taste that goes wonderful on pizzas and sandwiches. My favorite is on a nice chef's salad.